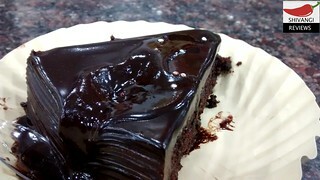 •The bakery is just beside McDonald’s and opposite to Reliance Shopping at Ansal Plaza. This is a famous hangout for youngsters in Greater Noida just at the end of Noida-Greater Noida Expressway. Being the only bakery in this section, it is easy to locate and catches the eye. •They have a wide range of pastries and savoury items, all the ‘shizzle’ a bakery should have. •It is most popular with people who come looking for cakes for anniversaries and birthdays. •They also have other packaged food items such as chocolates, tea cakes, biscuits, etc. and a lot of fast food items like pizzas, rolls, burgers, donuts, etc. •The staff was well mannered, attentive to our needs and very polite. •The items were severed promptly in paper plates and the items that had to be heated up before serving were served perfectly warm. •Tasted fine and was quite fresh with bites of blueberries in blueberry coulis layered on top. •The pastry had pieces of pineapple, apple and other fruits in the layers in between. •The tart blueberries went well with the sweet taste of the cake. •The taste of the truffle was quite rich and it was very bitter and rich. •The only issue at Big B is the storage of cakes and other bakery items. Owing to hot weather the owners should pay more attention to the storage of baked goods and store them at appropriate temperatures to ensure they taste just like they are meant to taste. The chocolate truffle seemed tasted slightly off. •This tasted quite similar to the Chocolate Truffle Pastry but with chocolate chips on top. •This wasn’t their best pastry, I did not like the taste very much. A very average pastry. The issues was clearly the storage because this too seemed a little off. •This is the nicest dessert at Big B. It was quite a delicious chocolate pudding and had lots of really rich chocolate. •The bread sponge was soft and melted in the mouth. This dessert was quite heavy and the chocolate was really rich. This dessert is such that you definitely cannot have more than one. •The good thing about Big B is that they have a wide variety of savoury items on the menu too. •I tried the Besan Khatai. It was very good. Quite delicate (I broke the biscuit into two the first time I picked one up). It was fresh out of the oven. •Next up, the Pista Badam and Single Badam biscuits and both were fresh and crunchy. These biscuits go really well with evening tea. I packed a bunch to take home. •Then came the Mango and Coconut Biscuits. Theere were a total of 15 different types of bakery biscuits which I hadn’t tried. I liked the variety. I would probably come back for some more. I love Coconut biscuits and it is my favourite buscuit. The coconut biscuits at Big B were fresh, crunchy and coconutty, just the way I love them. The Mango biscuit was wonderful and came with some Kesar on top. I loved the mango biscuit and I ate more than I should have. If you are a mango lover then do not miss this. •We were really full but there was still some Club Pizza to try. The pizza came with a really soft bread base and lots of vegetable pieces in between layers. There was a lot of paneer, onions and capsicums. It was a slightly spicy and had mayo and tomato sauce. •It was a very ordinary pizza but was worth the money charged for it. This is the bakery next door that everyone goes to for birthday cakes, pastries biscuits and savory items. Don’t go to Big B with your hopes up or you will be disappointed. It is a simple no fuss place.